When I first started working at Glasgow Women’s Library (GWL) back in 2005, I really had my eyes opened to the disparity between how men and women’s writing is viewed and valued. I’d studied English literature at University (a course that looking back on, was completely biased towards male writers) and I think I’d become used to male writers being ‘the norm’. Having my awareness raised at GWL, I started noticing more and more that in anthologies of poetry and prose, more often than not, men featured more than women – something that previously I simply wouldn’t have picked up on. I also started reading more writing by women and realising how many amazing writers I’d simply never heard of – and wondering why. Each year a study by Vida, an American organisation for women in the literary arts, shows that leading literary magazines focus their review coverage on books written by men, and commission more men than women to write about them. That’s why many incredible women writers remain ‘invisible’ to us. So I was delighted when one of my volunteers mentioned #Readwomen2014. Joanna Walsh, a writer and illustrator, started using #Readwomen2014 hashtag on Twitter, and it really took off. She had been inspired by two literary journalists who didn’t want to come out badly in Vida’s study and were willing to do something about it. Jonathan Gibbs in the UK and Matthew Jakubowski in the US both made a commitment to read only female authors for a set period. You can read more about Readwomen2014 at and also at and follow the project on Twitter @ReadWomen2014. And you can take the plunge and commit to reading more books by women in 2014. You will be amazed and inspired by the writing you will discover! Every year, as more and more libraries face unjust budget cuts and threats of closure, they amaze me by coming out fighting with real positive energy, which is fantastic! 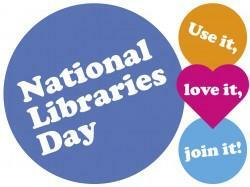 National Libraries Day is a great initiative, which encourages us to shout out about libraries and why we love them. It’s a chance to celebrate and simply have fun. Please please please, go along to your local library (or come and visit us at Glasgow Women’s Library), and tell us what libraries mean to you – why you use them, why your community can’t do without one, what makes them special places that need to be championed, protected and celebrated. As well as boosting staff morale and putting a smile on their face and a spring in their step, it really helps us build up a body of evidence about the impact that libraries have on individuals and their communities. Libraries are wonderful and vital – let’s use them, support them and cherish them so we don’t lose them.